Life was never easy for Jessica Diel. Growing up, Jessica’s single mom worked in nursing homes, restaurants, and ran six paper routes in Carthage with her children. But with six mouths to feed (and no child support whatsoever from Jessica’s father), all of that work provided the family with only a paycheck-to-paycheck existence. Still, even with Jessica’s mom constantly working, it was a loving, happy home. However, life began to change for Jessica when she was nine; she began developing constant, debilitating headaches. Her mom took her to McCune Brooks hospital, where she underwent a complete series of tests. Ultimately, those tests discovered a cyst on Jessica’s brainstem. In three months, Jessica was undergoing surgery at Children’s Mercy hospital in Kansas City to have a shunt installed. That was her first brain surgery. Jessica recovered and the family was back together. But Jessica’s mom was working constantly, just to pay the bills, and she felt guilty for leaving the three other kids at home unsupervised while she shuttled between Carthage and Kansas City while Jessica was convalescing. While recovering at home, Jessica could see her brothers and sister were making some bad decisions in their lives and her mom just didn’t have the time to watch over them. Jessica began giving her share of the paper route money back to her mom. She figured if mom had more money to pay the bills, maybe she could stay at home more often to properly raise the children. Jessica could see that, even though she dropped out of school after the eighth grade, her mother always wanted to make a better home for the family. So she worked even harder to eventually become a CNA. Her next goal: going back to school to get her GED. versed in families who needed help and, although she did her best to tune Ryan out that day, the message drifted through and Jessica ran it by her husband. They figured it was something they could try and, at the very least, they could get a nice meal on Thursday evening. After that first visit to a Thursday night Circles meeting, Jessica and Joel decided to go for it and they applied to be among the first class of Circles leaders. Interviews were held and the invitation came. Jessica and Joel were in! Jessica’s struggles aren’t over. She’s had four brain surgeries so far because she was born with a malformed skull and she was officially declared disabled. Medical bills have, and continue to be, astronomical. But Jessica and Joel work every day to pay down their debt. 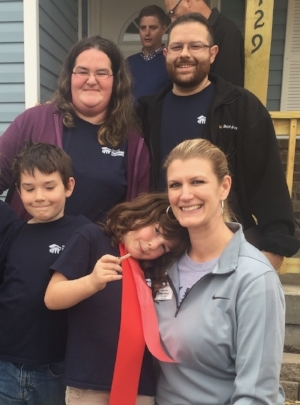 And, remarkably, late last year, the Diels became the first Circles family to be awarded a Habitat for Humanity home! They moved in on the weekend before Thanksgiving, 2017. Her mom may have been taken from her far too soon, but Jessica’s mother taught her that work gets you where you want to go. Thanks to the work ethic her mom instilled in her, and the social capital she’s earned by being a Circles Leader, Jessica is feeling as good about herself, and her family, as she’s ever felt. Recently, Jessica asked her young daughter what she wanted to do when she grew up. She said she wanted to be a mom because Jessica’s a great mom! After so many years of living her own mother’s advice, Jessica now knows she’s passed at least some of those great lessons on to the next generation.